Most brewers have probably had the experience - perhaps more often than we'd like to admit - of designing a beer recipe, then spending hours, days, or weeks agonizing over our choices of ingredients. The malts, hops, and yeasts may be familiar, but what about beer's fourth ingredient? How should we use water to flavor our beers? If you live in the United States and use a public water supply, your water provider is required to make a report of the water's contents available to you, free of charge. However, these reports are only required to provide information on health issues including levels of radiation and agricultural byproducts. The minerals that are important to brewers may not be monitored by your utility, or may not be included on the report. Even if they are, the information may not be up-to-date; water supplies can vary considerably. For example, here in rural Colorado, our municipal water supplies are generally reservoirs filled by snowmelt. In the spring and summer, the water level rises dramatically and reduces the mineral levels, which then rise throughout the fall and winter as the reservoir is again drained. If a recent and comprehensive water report isn't available, there are a few alternatives. The easiest option is simply to purchase water for brewing. This can be a commercial brand with a known mineral content, or it can be distilled or reverse osmosis (RO) water. Distilled and RO water are essentially pure water without any other minerals present, and they can be used as a blank slate to which the desired elements are added. "It's best to use either distilled or RO water in extract brewing." Another alternative is to send out a water sample for testing. Ward Laboratories (wardlab.com) offers its inexpensive W-6 Household Mineral Test, which provides data on all the ions of concern to brewers. The disadvantage of laboratory testing is that it only provides the information at a single point in time, and frequent testing is inconvenient and expensive. In my opinion, the best option for regular brewers is to purchase a home water testing kit with reagents for total alkalinity and general hardness. For the price of just a few laboratory tests, these kits allow the most important water parameters to be monitored periodically. If a substantial change is seen, a full laboratory test can determine which specific minerals have been affected. These testing kits are available from pool and aquarium retailers, and online. Gypsum (calcium sulfate), CaSO4: 1 g/gal will add 62 ppm Ca2+ and 147 ppm SO42+. Calcium Chloride, CaCl2: 1 g/gal will add 72 ppm Ca2+ and 127 ppm Cl-. You can see that bicarbonate will increase alkalinity, and calcium/magnesium will reduce it; this is the primary mechanism we'll use to adjust the mash pH. Since malt is acidic, in the mash it will tend to cancel out the effect of some residual alkalinity. Darker-colored malts are more acidic, and so a higher RA will be needed for a darker-colored beer to achieve the correct mash pH of about 5.5. Broadly speaking, brewing water should have an RA between -20 and 200 "ppm as CaCO3" (this seemingly contradictory-sounding unit just means that we're going to convert the effect of the ions into a common standard so that we can do math with them). The relationship between malt color and residual alkalinity is complicated, but in practice I find that targeting a general RA based on the wort's basic color (i.e. -20 for yellow, 20 for gold, 60 for amber, 100 for brown, and 150+ for black) is all that's needed to reliably reach a target mash pH range. 1. Calculate the RA of the source water. If it is too low, alkalinity can be added to the mash using chalk and/or baking soda. If it is too high, calcium and/or magnesium salts can be used to reduce the mash pH. In cases where the RA is much higher than desired, this may not be reasonable without adding a very large amount of salts. In that case, the RA can be reduced by diluting the source water with distilled or RO water. 2. Check that the flavor ions are not too high. In the case of sodium, I always stay below 50 ppm. Sulfate and chloride can range much higher. Sulfate over 50 ppm in a very malty beer, or chloride over 50 ppm in a very hoppy one, could be excessive though. If so, dilution with distilled/RO water can be used to reduce them. 3. Check that sufficient calcium is present. I try to have at least 50 ppm in the mash and 100 ppm in the boil. 4. Return to Step 1 and re-calculate. Repeat as needed. 5. Add sulfate and chloride salts for flavor, if needed. I like to use 100-200 ppm SO42- in moderately hoppy, and 200-300 ppm SO42-for very hoppy, beers. I'll target 50-100 ppm Cl- for moderately malty beers and 100-150 ppm in an intensely malt-forward beer like doppelbock. These flavor ions can be added to the kettle, so their impact on mash pH isn't a concern. It may seem obvious that, when not conducting a mash, there's no need to worry about the mash chemistry. Unfortunately, the reality isn't quite so simple. Malt extract is made by mashing, just as in a brewery. The resulting wort then has most of its water removed; liquid extract is concentrated to about 20% moisture content, and dried extract to nearly none. When the water evaporates, however, it leaves behind whatever minerals were present in the mash. If there was too much or too little of anything, that will also be true of the wort once the extract is reconstituted with water. For that reason, it's best to use either distilled or RO water in extract brewing, then use gypsum and/or calcium chloride to adjust the flavor ions (sulfate and chloride) as needed. Water makes up, on average, around 95% of beer. It's also the only ingredient that remains, essentially unchanged, in the final beverage. Though it can be intimidating at first, when distilled down to its fundamentals, adjusting water chemistry is no more complicated than any other aspect of recipe design. And paying attention to all four ingredients will reward brewers trying to perfect their recipes. 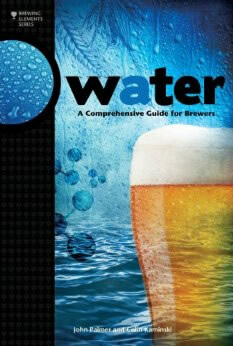 For more advanced information on water treatment and home brewing, check out the complete water book for homebrewer's written by John Palmer and Colin Kaminski. Adjust water to a specific beer style with the Comprehensive Water Guide. 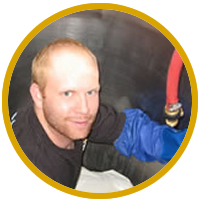 A nuclear engineer by trade, Sean Terrill has been home brewing for over nine years, and professionally for three. He is the owner of Two Mile Brewing Company, a brewpub-in-planning in Leadville, CO. He recently contributed an article on Seasonal Creep and Brewing Ahead of the Seasons.